DinArt Data Norge | Best Stock Photo Sites Review: Getty vs. iStock vs. Shutterstock vs. Fotolia vs Adobe Stock & More! Are you looking for a photo to make your brochure or website homepage stand out from your competitors? If so, you will find that looking for royalty-free media on the net brings up an overwhelming number of services to choose from. Depending upon the media you are looking to serve (photos, illustrations, vector art, audio, video) and the usage license you require, the sheer number of stock image companies can be daunting. Let’s face it, all this marketing lingo can also be intimidating. So let’s break it down and help you find the best stock images for your needs. We have composed a stock photography company comparison table that highlights the products and services offered by each company and the pros and cons of each. Referencing this table alongside our reviews below will help you to determine which stock photo company best meets your needs. If at any point you get confused by the lingo used in this article, please take a look at the terminology section on the comparison table page. 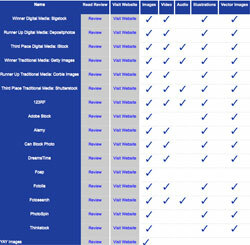 Digital media is any type of media that is used on computers, websites, blogs, etc. The images you see on websites are considered digital media as well as the audio or video tracks. Digital media files do not need to be as high resolution since they will be optimized for web and you might find yourself needing a lot more digital media files to use throughout your site so a subscription plan might be best in this case. BigStock is an affordable stock image service that specializes in images and illustrations. Their straightforward, inexpensive pricing model paired with a wide range of images to meet most digital marketing needs makes it the go-to location for the best stock photos for online use. This is the company we use for our website’s photos most often. Our experience with their customer service department has been top-notch. However, if you are looking for vector images, you will definitely pay more here so you may want to look to another company. Price at time of writing: Image credits start at $35 for 10 images up to $495 for 500 images. Subscriptions start at $69 per month for 5 images a day and go up from there depending on the number of photos and how frequently you download. Ongoing: our readers have access to 5 free credits with promo code SPC6 (if that doesn’t work, try DIGIX210). Seasonal: Bigstock is offering 15% off your first month for any subscription. Click here take advantage of these offers! Depositphotos is a relatively new company with an affordable pricing structure. Their excellent selection of media is available for one of the lowest per image costs around. That being said, we do not find their current library robust or easily searched, so it may be difficult to find what you are looking for. But, if you can find the right image for you, the price will be good and they, have a nice user feedback option so that you can learn more about others’ experiences with a particular artist/photographer before buying or to guide your image search further. They offer images and video, but no audio. They have a good selection at one of the lower per image costs around, with low-resolution photos starting at around $1. Price at time of writing: Subscriptions start at $29/month ($0.96 per image) or $299/year and on demand images start at $4.90 per image. iStock is run by the highly reputable Getty Images (our #1 pick for traditional stock photography, see below). Graphic designers and small advertising agencies find iStock to be a great resource due to their low prices, affordable subscription plan, image variety and versatility. With millions of pieces for sale, iStock is one of the better choices for those in need of lots of online, royalty-free, low-resolution images for websites or e-newsletters. The iStock website can be a bit challenging to users who prefer to browse without a keyword in mind, as it is difficult to just browse without first typing in a keyword. Overall the search function via keywords is easy and intuitive for the reader. This is a good service that offers great images at a good price. iStock is one of the most commonly utilized online stock image companies these days for graphic designers and small advertising agencies due to their low prices, affordable subscription plan and versatility. With millions of pieces for sale, iStock is one of the better choices for large quantities of online royalty-free content, especially if low-resolution is acceptable. Price at time of writing: Starts at $12 for 1 image/credit and subscriptions start at $40/month for 10 images. Until September 30th, 2017: All customers save 10% off credits with coupon code ZKFPC46N; New customers can save 12% off Subscriptions with coupon code ZKFPC46N; Click here to take advantage of these offers! What Are the Best Stock Photography Sites for Traditional Media? Traditional media is what you typically think of for media. This is media that is printed in publications, used outdoors or on television. You see them every day from magazine ads to TV commercials. Anything that uses visuals or audio in a commercial form must be purchased or have the original rights to. And often, depending on if people or places are involved, there might be a time limit or renewal fees so the models, artists and creators can continue to get fairly compensated. You might require higher resolution photos for traditional media which is why they might cost you more but the quality is much better. From historical photos to celebrity photo bombs. Getty Images offers one of the biggest databases of stock media, especially for premium, conceptual, high-resolution and editorial images. If you are working in traditional media such as print, TV, billboard or radio, high-resolution creative will be mandatory in designing high impact campaigns and no one offers more exclusively licensed, high-res art than Getty. Getty offers a wide array of royalty-free media with over eighty million different high-design, conceptual pieces for sale. It is also a good option for multinational companies and global advertising campaigns as they have websites in many different languages that will help you navigate usage laws across country borders. The website is easy to search and navigate for high-concept imagery, videography and sound. Price at time of writing: Price varies depending on the rights, usage and size and can be upwards of hundreds of dollars each. 123RF offers one of the most affordable subscription programs, with low-resolution photos starting as low as $1 per photo. It’s a great alternative to many of the big stock photo services and they have a wide-selection of over 37 million images video, audio, vector files. And you can expect high-quality photos for the price too. 123RF has beautiful lifestyle, editorial and non-cheesy photos making them an even better value. They have live chat and phone support should you need it and an easy to use checkout process. The one downside we found from 123RF is the search results didn’t have many filtering options, which isn’t ideal if you have something specific in mind, but their photos are all so great you might not need them! Price at time of writing: Starts at $39 for 5 images and subscriptions start at $79/month for up to 150 images per month (depending on how many months you commit to). Shutterstock is a good resource for high-resolution images, especially for large-format designs (billboards and other print media). They offer a variety of subscription plans to meet various user needs, making its pricing model more flexible than some other high-res photo options. With Shutterstock’s huge library of 70 million images and files, you won’t be disappointed in the selection. While they do offer stock photos, videos, illustrations, and vector, they do not have audio files in their database, making this another impediment from a top ranking relative to Getty Images, which has all forms of media in their library. Shutterstock would be a great choice for agencies, publications and companies with the need to use high-quality photos and illustrations often. Price at time of writing: Starts at $29 for 2 images and subscriptions start at $49/month for 10 images. Due to the considerable size of our stock photo websites comparison table, we are putting it on another page so that it can be more easily referenced. Please visit our stock photography service comparison table (or click on the image on the left) to view the feature details of each stock photography company that we review in this article. We will do our best to continue to add to this table as we find more stock photo companies and update the current companies listed as they add new features. In 2015 Adobe, the popular graphic design software company, released their own version of a stock photography library with more than 40 million photos, illustrations and vector images available. You can also submit your images to sell which makes sense and is convenient since they cater to the creative community and have a built-in network of graphic design and photographer customers already. They do not offer video or audio files, so if you’re a multimedia user, you’ll have to look elsewhere. Adobe Stock is still in the early stages, so we will have to give them more time to see where they fit in our rankings. Price at time of writing: Starts at $9.99 per image and subscriptions start at $29 for 10 assets a month (and first month free with annual plan). Alamy has one of the largest selection of images and, with more than 80,000 new stock images added daily sourced from around the world from 173 countries. The result is a wide-range of culturally diverse photos from all geographic landscapes and areas giving you more than 90 million high-quality images to choose from. Alamy only sells per image so no subscription plans are available and the price varies depending on the size and the rights of the photo. You can choose to have it licensed which can expensive depending on what you are using it for or do a rights-managed option which is limited use and time for a photo. Much like other online shopping sites, it’s easy to check out without an account, but the number of options can be a bit overwhelming if you are new to stock photography. Price at time of writing: $19.99 per image (for personal use). No subscriptions offered. Can Stock Photo adds 25,000 pieces of stock media to their site every day and offers a good value for low-resolution photos. They also have video. However, they do not have audio files, and their library is much smaller than many of their competitors, but if you can find what you are looking for, this could be a great option. And with one-click downloading and easy checkout without creating an account, it’s a great choice for quick and easy purchases. Price at time of writing: Photo credits start at $9 for 12 credits, subscriptions start at $39/week for 7 images per day. Corbis has been a widely known and well-respected stock image provider with one of the largest database of images available (more than 100 corporate image partners and 30,000 photographers). However, they were acquired by Visual China Group (VCG), and as a result, they have migrated their content library to Getty Images effective May 2, 2016. This is good news for you since Getty is our #1 pick. Corbis is no longer operating under its brand name. Since 2000, Dreamstime has been providing a huge selection of high-quality digital images at affordable prices with a goal to connect image sellers with buyers. Their community-based site gives more than 13,000,000 registered members access to photos submitted from 200,000+ photographers from around the world. All images are reviewed and approved by experienced editors to ensure the quality control. In addition to photos, they have a library of free images, clip art and vectors and have a number of incentives for photographers and users alike. They also offer monthly plans or pay per photo credit packages. Price at time of writing: Photo credit packages start at $14.99 for 11 credits, and subscriptions start at $25 a month for 5 images. Foap is a fairly new service (and concept) that allows anyone the ability to sell photos taken from their iPhone. Users can download the app, take a photo, upload the photo to the Foap market and list it for sale. Before your photo is listed in the marketplace, it must receive an average rating of 2.6 or higher from 5 other users. Photographers earn $5 per sold photo. For users looking to purchase photos, they start at $10 per photo. This is a photo only site, no vector, no audio, and no video. But their pricing is super straightforward, $10 per image (or down to $7.50 each if you buy in bulk). Price at time of writing: $10 per photo or credit packages start at $180 for 20 photos up to $750 for 100 photos. Fotolia (which has been acquired by Adobe) has a huge database of over 81 million pieces of media. With tens of thousands of photos, art and video uploaded daily, there is a huge selection of content to choose from, and Fotolia has one of the largest libraries among the standard providers (now including Adobe’s library). They source for quality contributors and claim to offer artists the best rates on the market. They allow users the flexibility to pick the option that works best for them. Either purchasing through a monthly or annual subscription or credit based pay as you go system. However, you can’t do a single photo download. They are a moderately priced stock image company and also offer purchase options for less frequent users. Price at time of writing: Credit packs start at $14 for 10 credits. Subscriptions start at $25/month for 5 images. Since 1996 PhotoSpin has believed that all creatives should have quick access to good content at an affordable price. PhotoSpin’s pricing is based on a subscription model. You pay once for access and then can download anywhere from 500-1000 images per month. Claiming to be the first photo subscription service, Photo Spin has 2 subscription options: Plus starts at $429 a year for up to 500 3600px images and SuperPlus which starts at $649 per year for 500 images at 5100px. The only difference in plans is the quality/size of the photos, but each gives you the same access to photos and similar increments of plans (500, 750 or 1000 photos per month) for a yearly subscription. Price at time of writing: Single images are $2-30 depending on the size of photo. Subscriptions start at $429 a year for up to 500 3600px image. Our readers can get 10% off PhotoSpin’s annual subscription with the promo code WeRock10.Click here take advantage of this offer! “Created for and by online people” Yay Images is a relatively newer company and provides unlimited streaming of online images. Streaming, meaning you can use them on your site but you can’t download them to save for offline use (or to make modifications to). There is no downloading or uploading for YAY Images. (Yay!) Instead, you receive a link that you put wherever you want the image to appear. They do however allow you to make simple edits to photos within their site and will even host them for you forever (even if you cancel). Their visual search allows you to drag and drop a photo you are looking for, and it will search for something similar (like Google image search). We tested it though, and it’s not all that accurate. One of the other downsides to Yay is they only offer subscriptions; no single image purchases are available, unfortunately. Price at time of writing: Plans starts at $9.90/month with 1 download and additional photo downloads for $10 each up to $99 per month for unlimited streaming and up to 1,000 downloads. From time to time you might stumble upon the silly stock photo that makes you laugh (at least we do!). Here’s a compilation of some stock photo clichés along with song (almost as cheesy as the photos). Finding a stock photography company to suit your needs can be difficult depending on what you intend to utilize your downloaded media for. Aside from ensuring that you find a company that will fit within your budget, it is also important to find a legitimate company that details licensing requirements for each image or piece of media they provide. It is important to understand each type of license offered for image or other media use in order to avoid the potential of a legal case being brought against you or your business. Most large stock photography companies have detailed information available on their websites. If a company does not offer this information, it is always prudent to contact them directly to find out about usage regulation. We also recommend familiarizing yourself with the stock photo usage types, so you know the difference between royalty-free and rights managed and learn more about stock photos in our royalty free images article.